Once upon a time, there was a sweet house in the San Roque neighborhood of Santa Barbara. The home was set on a big corner lot on a beautiful tree-lined street with other charming houses that were all built in the 1920s and ’30s. It was a neighborhood right out of a storybook. On a recent sunny day, I walked up the flower-lined walkway through the front door of this home. Much like a storybook character, I was amazed at what I saw. “My, what high ceilings you have. My, what large rooms you have. And my, what beautiful details you have,” I was tempted to exclaim. I pinched myself to ensure that this was no fairy tale and stepped across the threshold into the deluxe interior. It was much larger than I had expected from the street. All three bedrooms were oversized, each with its own bathroom. My favorite bathroom featured both a deep inset Jacuzzi tub and a dual-head, glass-enclosed shower separated by a glass brick wall. The kitchen stood out as one of the most stylish parts of the house, with gleaming appliances and quality cabinetry. A huge island with a hefty curving, gray countertop offered plenty of room for meal preparation, dining, or socializing. The home boasted a formal dining room, too. As I moved through the rooms, I noticed that although it’s situated on a busy corner, it’s quiet inside the house. Dual-paned windows keep it serene, and there’s no traffic noise at all. Throughout the house, the fanciful details continue. The skylights and windows are wood-latticed and framed, and there are built-in shelves and nooks and three tempting fireplaces. Curved windows echo arched doorways, and beamed cathedral ceilings soar overhead. French doors lead to multiple charming outdoor areas, including a brick patio in the backyard with a raised six-person Jacuzzi. 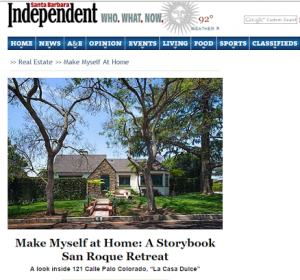 I had the feeling that I was in a luxurious yet comfortable hotel or resort, so I wasn’t surprised to learn that the house, aptly named La Casa Dulce, has been used most recently as a vacation rental. Whether for a few nights or many years, I could certainly imagine making myself at home here. While the neighborhood is full of 1930s-era houses, and this house itself was built in 1936, it was completely remodeled in 2002 with obvious quality craftsmanship and details. The uptown location is extremely walkable. With Gelson’s, Jeannine’s, and Chaucer’s all within a few blocks, what more could one need? I could call this peaceful retreat my home sweet home and live here happily ever after. 121 Calle Palo Colorado is currently for sale in Santa Barbara, listed by Steve Epstein of The Epstein Partners with Keller Williams Realty. Reach Steve at (805) 689-9339.